WhatsApp’s updated policy means that the company will also provide users’ device information, including type of operating system and other smartphone characteristics. Facebook will employ the phone number only internally to identify WhatsApp users better, so it can help advertisers with their target groups. The ads would come through a special Facebook program called “Custom Audiences,” which lets a company upload consumer data on Facebook. Facebook then matches the list with its list of customers and shows them tailored ads. User data is not given out to advertisers. The good thing is that you have the ability to stop WhatsApp from handing out your information to Facebook, so if you happened to have unknowingly agreed to the new WhatsApp's terms of service, then its not too late to opt out. How To Stop WhatsApp From Sharing Your Information. 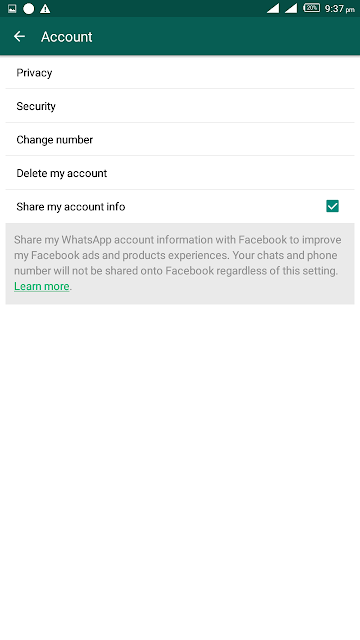 ==> Launch your WhatsApp and head over to your WhatsApp settings. ==> Uncheck the "share my account info" box. ==> You will be asked for confirmation, just click on "don't share". Now your privacy has Just been successfully restored and you are save once again.